Lesson Plans and Resources for Every Day of US History, World History, & Civics! Really exciting news, everyone! After a year of organizing, updating, and writing lessons, my new site is now LIVE! What's so exciting about this site? Well, not only do you get the most engaging history resources available anywhere for every day of the year, but there are now LESSON PLANS for every day! You don't need to wonder about the best way to use a resource, plan the order of a lesson, or worry about how to implement a project. At StudentsofHistory.com all the lessons are done for you! 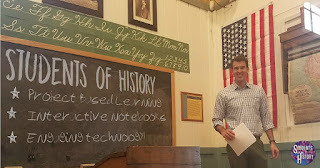 We have complete curricula available for US History, World History, and American Government. Each curriculum is broken down into easy-to-manage units of about 4-10 class periods. Each period includes a short lesson plan with 3 or more resources plus links to relevant videos to show and strategies to use. You'll never have to stress about a lesson plan again!!! Take back your life and focus on what really matters: you and your students. Magic-motion PowerPoints with moving video portraits that bring historical figures to life! Editable tests, quizzes, & more! I promise you will not be disappointed by these amazing curriculum packages. You can subscribe and cancel any time or join for a whole year and save big! You can download free lessons on our page as well to check out the resources! Thanks so much for stopping by to check us out!